Teach Mo Chroi' meaning 'Home of My Heart', is set upon an acre of meadowland amidst the farmland of Ballintubber, Co. Mayo where your nearest neighbor is likely to be the cow or sheep in a nearby field. Drive down our little boreen, through the canopy of trees, to the gates of 'Teach Mo Chroi', a fresh friendly country home overlooking the Partry Mountains and Croagh Patrick. Our boreen, Irish for tiny one-lane road, is just a 1/4 mile off N84 and midway between Castlebar and Ballinrobe Town. Only a 15 minute drive into Westport, a bustling seaside town on the Atlantic's Clew Bay, an hour to Galway City, and 25 minutes to Cong Village, home to Ashford Castle and The Quiet Man Cottage. In this calm and tranquil setting there's nothing quite as nice as awakening to the birdsong on a fine summer morning. Relax with a cup of tea on the patio beside sunlit mountains; or pluck a novel from the book shelves and settle in for a good read. When night falls, the sky is transformed into a visual feast of stars! The house is in an ideal location for touring the West of Ireland. Whether you've an hour or the day, consider visiting these worthwhile nearby offerings: 12th Century Ballintubber Abbey, Ballinrobe Horse races, Heneghans Heritage Centre, Corrib Cruises, The Ceide Fields, Kylemore Abbey, Croagh Patrick, Westport House & Country Park Amusements, The Fjords at Killary Harbor, Our Lady of Knock Shrine, Galway City, the spectacular cliffs and superb beaches of Achill Island, or for a special treat learn to fly a hawk at Ashford Castle's Falconry School. For the thrill seekers and outdoorsmen, try the unique challenges offered at the Killary Adventure Center. Teach Mo Chroi' is a family friendly home with many desirable features to its credit; providing excellent accommodations to large groups, for reunions, anniversaries, and special family gatherings. There is ample parking for 6 vehicles. The house is equipped with US 110v outlets as well as the standard Irish 220v, so bring along your I pods, etc. For the film buff, relax and enjoy a selection from our more than 30 Irish Films on DVD. From the spacious kitchen to the warm inviting living room, every room is large and comfortable. The Master Bedroom is en suite with a King bed and walk-in closet. All bedrooms are fitted with ultra plush US mattresses. The Extra large Dbl Bedroom has 2 Queen beds and TV w/DVD-VCR. Two additional Bedrooms host a Queen & Single bed in each. There are 2 more bathrooms with tub and shower units as well as a large utility room w/washer and dryer. Great water pressure throughout the home. Cartronbower boreen serves as a walking route to many of the locals because its peaceful and rarely traveled. Wander down its winding path and you're likely to encounter cows, horses, or donkeys in the surrounding fields, each known to enjoy a carrot or apple from a friendly passerby. In early Spring, the fields are alive with the sights and sounds of baby lambs, a vision to behold for children and adults alike. A portion of the front garden is a soccer/Gaelic football field complete with 2 netted goals. Additionally, there's a paved area for basketball with 2 backboards, child's swing set, and a patio complete with furniture and BBQ Grill. My husband is originally from Ballintubber Co. Mayo. His parents still live in this tranquil little village. We found ourselves travelling to Ireland more and more as the years passed and our family grew. Renting a place large enough to house our family became an ever increasing challenge and always required a drive to visit the extended family of cousins and grandparents. We knew eventually we would build somewhere and decided that this village we called Home was the only real choice for us. We designed and built the house over the space of 2 yrs seeing to all the important details ourselves. It was and still is an expression of our love for the area and of Ireland itself. When we came to realize this, the only proper choice for a name was Teach Mo Chroi' or 'Home of my Heart'. We are Karla & Gerry Geraghty. We are raising 4 children, live and work near Chicago, Illinois. We originally chose the site for its close proximity to family, its tranquil setting, and mountainous views. Building our own home allowed us to pack it full of unique features and details not found in other homes. Our location makes us a great choice for touring the West of Ireland. We are within an hour of many of Irelands treasured landmarks and tourist attractions. Ashford Castle in Cong, Croagh Patrick in Westport, and Achill Island are merely a few of the places a visitor must see. The town of Westport is full of Irish music and merriment in any number of traditional pubs which line its cobblestone streets. Teach Mo Chroi' is a family friendly home with many desirable features to it's credit. The house is equipped with US 110v outlets as well as the standard Irish/European 220v, so bring along your ipods, laptops, and cameras, but leave the converters at home you won't need them. No need to pack that bulky hair dryer we have 3 for use during your stay. All of our bedrooms have very comfortable thick American mattresses which will provide a great nights rest after a long day of touring. We offer password protected WIFI as well as an extensive selection of Irish Films (30+) on DVD and also numerous award winning American films for your viewing pleasure. If you enjoy a good novel we have many to choose from in our library of books. Our Satellite (SKY) TV has a considerable number of channels and special kids programming (Disney and Nickelodeon) to please the whole family. The grounds of our property offer a number of activities for families to enjoy together; soccer, basketball, kids swings, outdoor furniture and a Weber Gas Grill (usable May-Sept) to dine Al Fresco on our large patio. Short walks to explore the farmland surrounding the home are enjoyed by most of our guests. toilet, combination tub/shower, Electric Shower. Wall mounted hair dryer. toilet, shower, Master Ensuite is a seated shower w/Handheld & Rain shower. Two family bathrooms with tub and shower units and an ensuite bathroom w/seated shower as well as a large utility room w/washer and dryer. We have a local petrol station, cafe and grocery within 2.5 miles of the house. Lough Mask and Lough Corrib are in nearby Ballinrobe and Long. Views of the Party Mountains and a beautiful view of Croagh Patrick from the kitchen and Patio. Bring your own laptop or smart phone and use our wireless connection. Password protected. Flat Screen LED TV, Extensive DVD Library, Shelves packed with novels for your reading pleasure. Kitchen is equipped with almost every conceivable appliance. We have additional chairs available to expand seating. Large bedroom has TV-DVD as well as Living Room. Over 30 Irish Films on DVD and many other award winning films to select from. Picnic table and additional seating for dining al fresco. Wood Stove: Wood & Solid Fuel burning stove in the living room. Parking for RV/Boat/Trailer. Home is equipped with USA 110v outlets as well as 220v Irish outlets, 3 hair dryers, property has basketball court, wooden swing-set, soccer/gaelic football field w/goals, adult patio swing, patio furniture, and BBQ Grill. Accommodations are not available for renters under 25 unless accompanied by their family. Handicapped Accessible (may have limitations): Offering a shower chair for use while bathing. The home has large 5 ft. hallways is on one level and no stairs. Wheelchair Accessible (may have limitations): Like most Irish homes, there is a stoop outside every outside door. However, once inside the home there are no stairs or thresholds, and 5 ft. wide hallways. A wheelchair moves freely throughout the home. Charming, comfortable, well appointed family home in country setting. We thoroughly enjoyed our stay. The house is clean, comfortable, beautifully decorated and very well equipped. It is spacious and has beautiful country lanes that offer fabulous photo opportunities. We loved the collection of bird houses along the fence posts...and a visiting rabbit. We would definitely stay here again and highly recommend it to others. This was my third time renting the country home in Ballintubber. As always it was a perfect location for our big group to wander on day trips from Galway to Achill Island and in between. The house is in a absolutely gorgeous area and the house and grounds are very well maintained. Hope to come back again. We are happy to have you as our guests. The fact that you’ve come back 3 times speaks for itself. I hope we can welcome you again to our home! The house has a lot of room for the family, and is equipped for whatever you need during your stay. It is in a good location for exploring County Mayo and the coast. Maura was very helpful, recommending things to do in the area. We really enjoyed our stay. 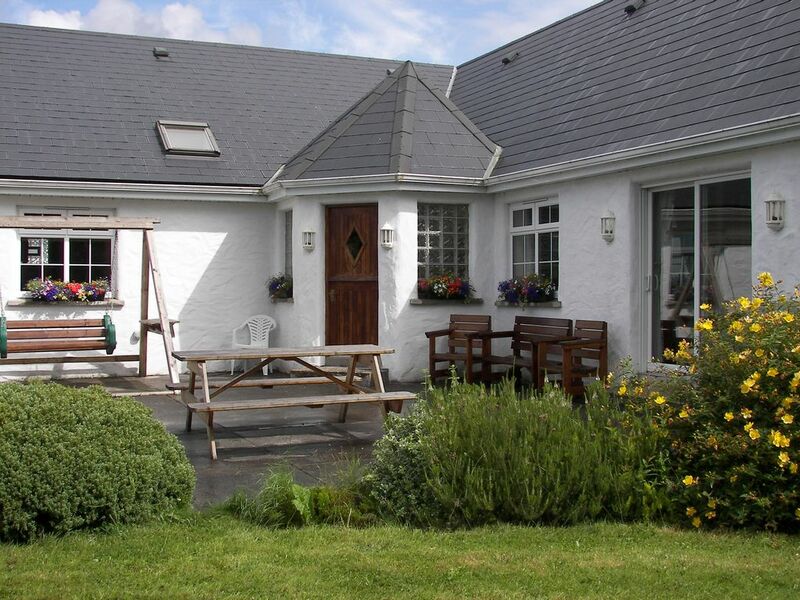 Teach Mo Chroi is an idyllic and functional home away from home in County Mayo Ireland. Will return! This Irish cottage is a self-catering home that fit our needs completely. 9 adults had plenty of room for 24 hour quality living - eat-in kitchen where we had many delicious meals, 3 spacious bathrooms, very comfortable beds, living room with a library and DVD player (too busy to use! ), washer/dryer, abundant linens, a patio with a grill, picnic table, chairs, swing set and tire swing, beautiful view of Croagh Patrick and surrounded by green pastures with sheep and cows. We all loved living there for 2 weeks - can’t imagine better accommodations. Ballintubber is convenient to Westport, Castlebar, the Western Greenway for biking, just north of Galway, the train to Dublin, local pubs and restaurants serving gourmet food, especially the Village Inn. It will always be in our hearts and minds...we hope to stay there again and continue exploring this lovely country. Can’t imagine a better way to experience true Ireland and its friendly people. Thoroughly enjoyable place to stay in the west for a family or group that needs some space. It is about 15 minutes to Westport by car and 25 minutes to Cong/Ashford Castle. Loads of historical buildings nearby. Great views of Croagh Patrick when the weather permits. Very comfortable with lots of amenities; soccer / Gaelic football / hurling pitch and basketball courts. Everything is clean and in working order, and there is an interesting blend of European and North American appliances / tools using the best of both design philosophies. Owner and property managers are very friendly and hospitable. Nestled in the tranquil village of Ballintubber, Co. Mayo; Teach Mo Chroi' is 15 mins East of Westport, 10 mins South of Castlebar, and 10 mins North of Ballinrobe Town. Cong Village and Ashford Castle are 25 mins away. Teach Mo Chroi' is ideally located for touring the West of Ireland, with scenic drives and many interesting places to visit and explore. We'll help you plan a trip to remember, you need only ask! For the outdoorsmen or adventure seeker, there's fishing at Lough Carra or Corrib as well as a great slection of activities at Killary Adventure Center. Climb Croagh Patrick and enjoy an incredible view of the Atlantic's Clew Bay atop St. Patrick's Mountain. Other Activities: Childrens Swings, Basketball court, Soccer/Gaelic field and Patio with Furniture & Grill are all on the property. Golf: Ireland remains one of the worlds best golf destinations. Golf enthusiasts will enjoy a variety of exceptional Golf Courses to choose from. Those in our area include: Ashford Castle Golf Club in Cong, Westport Golf Club, Clew Bay Golf Club, Connemara Championship Links (Balliconnelly), Mulranny Golf Club, and Ballinrobe Golf. Every Rental has a One-Time Cleaning & Utility Charge of 150 EURO which covers Cleaning, Electric, Oil Heat & WiFi and hostess fees. The NIGHTLY RATE only applies to stays up to the 6th NIGHT after that the weekly rate applies. There is a REDUCED NIGHTLY RATE for stays exceeding One Week/7 nights.